Have you ever seen pictures from Comic Con where someone is dressed up in a full ironman suit and wondered: “How did they do that”? Well what if I told you there was a way that you too could make your own costumes? Regardless of how much or how little experience you might have, anything is possible with the right teacher! From building your own helmets to adding lights and motorized parts to preexisting pieces, The Heroes Workshop can teach you like nothing else. What is the Heroes Workshop? The Heroes Workshop began a few years ago when Stealth Cosplay noticed a sufficient lack of tutorials and just overall knowledge sharing about the topic. For those of you who don’t know who Stealth is, he’s a ridiculously talented cosplayer that specializes is all kinds of armor making. Whether it’s Ironman, War Machine, RoboCop, Saiyan armor or even the Gold Zeo Ranger, if there’s an armor component to it, Stealth is your guy. 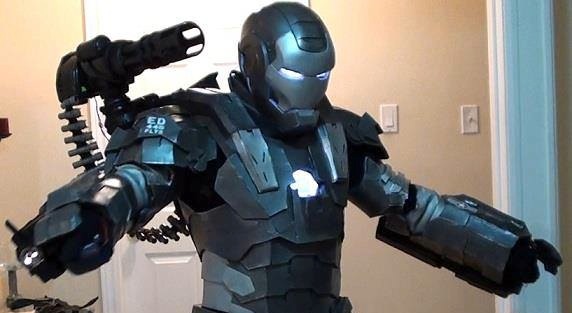 Motorized parts and lights make this a War Machine costume like no other. Though unlike other cosplayers who focus on competitions or just doing it for fun, Stealth gets the most enjoyment out of doing all this for/teaching others. It was because of this that he initially created The Hero Tutorial, which were a series of old step by step YouTube videos that could not only walk you through an Ironman-esque project from start to finish; but we’re also incredibly fun to watch. What Can I Learn To Build? Again, the Heroes Workshop wouldn’t be a static venture – ie: fund this and get 7 how-to videos – but will continue to make more and more videos responding to new ideas and requests from fans if fully funded. At the very basic level, you would learn the various methods of building an armored suit. 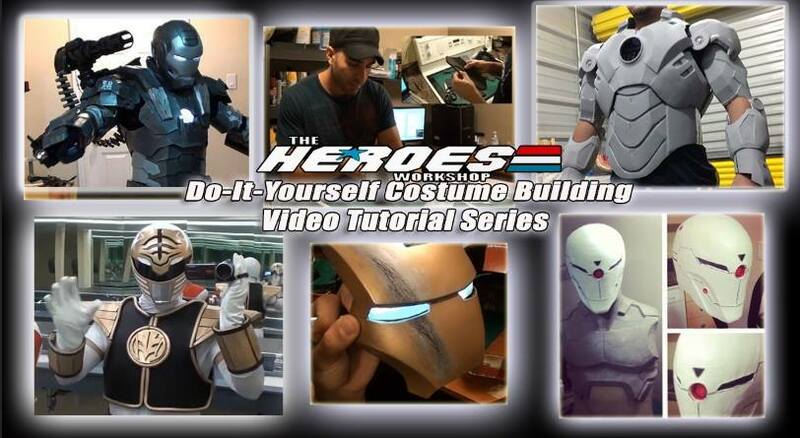 Additional levels could teach you how to add electronics of all kinds to your costume as well as how to mold and cast different armor parts for easy reproduction. Best of all, all of this information would be presented in an easy, fun and fully explained way. Why Should I Build Costumes? Those of you who already cosplay know how awesome this idea is and what it can lead to. Though for those of you who don’t, the reasons to make your own costumes are astounding if not endless. Anyone who has ever dressed up as a character before knows these feelings. To look back upon your costume, to see it start to take shape and explain “Wow, I’m making this!” is truly a moment like no other – especially when it’s armored based. The confidence that comes out of this is honestly something everyone should feel. This project is actually very near and dear to my heart because it’s how I started cosplaying. After watching two to three 7 minute videos from Stealth’s old Hero Tutorials, I was able to create a full Ironman Mk XLII armor. If I could do that with the old videos, just imagine what you can accomplish with the new Heroes Workshop. If I could learn to make this, imagine what you can do! Whether to further your existing Cosplay knowledge, to gain a little self confidence/discover what you can create or to just take your mind of things, costuming is an amazing hobby – and Stealth is the one to teach you. Though don’t take my word for it. Ask any armor cosplayer. Ask the tons of people over on the RPF Prop Forums. Chances are, they’ve heard of/already learned something from Stealth. To help fund this project, please check out the Heroes Workshop on KickStarter and donate what you can. Every little bit helps and everyone can benefit. For more about Stealth, check him out on Facebook at The Heroes Workshop. 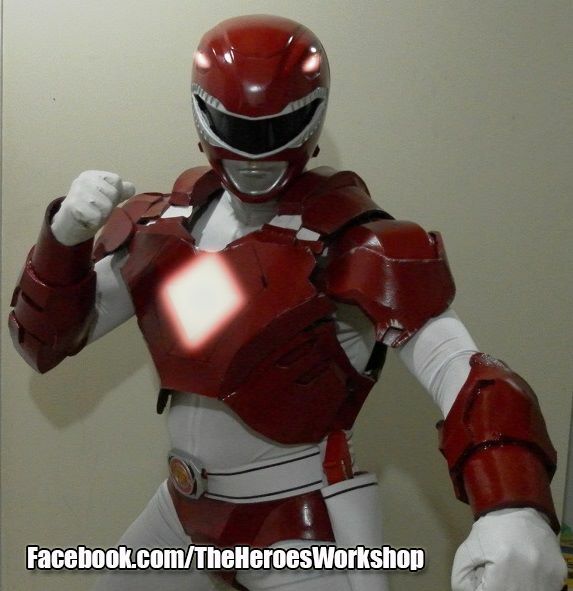 Yes, that is an armored Red Ranger. Again, ANYTHING is possible!